After the very successful launch of the original “Ryzen” (Zen/Zeppelin – “Summit Ridge” on 14nm), AMD has been hard at work optimising and improving the design: “Ryzen2” (code-name “Pinnacle Ridge”) is thus a 12nm die shrink that also includes APU – with integrated “Vega RX” graphics” – as well as traditional CPU versions. While new chipsets (400 series) will also be introduced, the CPUs do work with existing AM4 300-series chipsets (e.g. X370, B350, A320) with a BIOS/firmware update which makes them great upgrades. We are comparing the top-of-the-range Ryzen2 (2700X, 2600) with previous generation (1700X) and competing architectures with a view to upgrading to a mid-range high performance design. 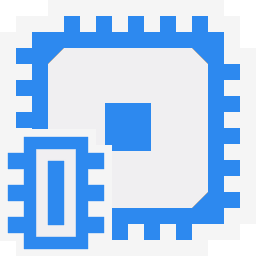 L1D / L1I Caches 8x 32kB 8-way / 8x 64kB 8-way 6x 32kB 8-way / 6x 64kB 8-way 8x 32kB 8-way / 8x 64kB 8-way 4x 32kB 8-way / 4x 32kB 8-way Ryzen2 data/instruction caches is unchanged; icache is still 2x as big as Intel’s. L2 Caches 8x 512kB 8-way 6x 512kB 8-way 8x 512kB 8-way 4x 256kB 8-way Ryzen2 L2 cache is unchanged but we’re told latencies have been improved. And 4x bigger than Intel’s! L3 Caches 2x 8MB 16-way 2x 8MB 16-way 2x 8MB 16-way 8MB 16-way Ryzen2 L3 caches are also unchanged – but again lantencies are meant to have improved. With each CCX having 8MB even the 2600 has 2x as much cache as an i7. 64 full-way 1536 8-way 64 full-way 1536 8-way 64 full-way 1536 8-way 64 8-way 1536 6-way No TLB changes. 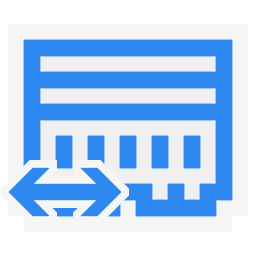 64 full-way 1536 2-way 64 full-way 1536 2-way 64 full-way 1536 2-way 8 full-way 1536 6-way No TLB changes, same as 4kB pages. Memory Controller Speed (MHz) 600-1200 600-1200 600-1200 1200-4000 Ryzen’s memory controller runs at memory clock (MCLK) base rate thus depends on memory installed. Intel’s UNC (uncore) runs between min and max CPU clock thus perhaps faster. 2400 / 2933 2400 / 2933 2400 / 2666 2533 / 2400 Ryzen2 how supports up to 2933MHz (officially) which should improve its performance quite a bit – unfortunately fast DDR4 is very expensive right now. 14-16-16-32 7-54-18-9 2T 14-16-16-32 7-54-18-9 2T 14-16-16-32 7-54-18-9 2T 16-18-18-36 5-54-21-10 2T Memory runs at the same timings on both Ryzen2 and Ryzen1 but we shall see if measured latencies are different. Results Interpretation: Higher rate values (GOPS, MB/s, etc.) mean better performance. 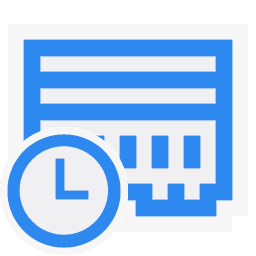 Lower latencies (ns, ms, etc.) mean better performance. Environment: Windows 10 x64, latest AMD and Intel drivers. 2MB “large pages” were enabled and in use. Turbo / Boost was enabled on all configurations. Total Inter-Core Bandwidth – Best (GB/s) 54.9 [+15%] 46.5 47.8 39 Ryzen2 manages 15% higher bandwidth between its cores, slightly better than just 11% clock increase – signalling some improvements under the hood. Total Inter-Core Bandwidth – Worst (GB/s) 5.89 [+2%] 5.53 5.8 16.3 In worst-case pairs on Ryzen must go across CCXes – and with this link running at the same clock (1200MHz) on Ryzen2 we can only manage a 2% increase in bandwidth. This is why faster memory is needed. Inter-Unit Latency – Same Core (ns) 13.5 [-13%] 15.4 15.6 16.2 Within the same core (sharing L1D/L2), Ryzen2 manages a 13% reduction in latency, again better than just clock speed increase. Inter-Unit Latency – Same Compute Unit (ns) 40.1 [-7%] 43.5 43.2 47.3 Within the same compute unit (sharing L3), the latency decreased by 7% on Ryzen2 thus L3 seems to have improved also. Inter-Unit Latency – Different Compute Unit (ns) 128 [-6%] 132 236 – Going inter-CCX we still see a 6% reduction in latency on Ryzen2 – with the CCX link at the same speed – a welcome surprise. The multiple CCX design still presents some challenges to programmers requiring threads to be carefully scheduled – but we see a decent 6-7% reduction in L3/CCX latencies on Ryzen2 even when running at the same clock as Ryzen1. Aggregated L1D Bandwidth (GB/s) 862 [+18%] 615 730 837 Right off we see a 18% bandwidth increase – almost 2x higher (than the 11% clock increase) – thus some improvements have been made to the cache system. It allows Ryzen2 to finally beat the i7 with its wide L1 data paths (512-bit) though with 2x more caches (8 vs 4). Aggregated L2 Bandwidth (GB/s) 736 [+32%] 542 556 329 We see a huge 32% increase in L2 cache bandwidth – almost 3x clock increase (the 11%) suggesting the L2 caches have been improved also. Ryzen2 has thus 2x the L2 bandwidth of i7 though with 2x more caches (8 vs 4). Aggregated L3 Bandwidth (GB/s) 339 [+19%] 398 284 238 The bandwidth of the L3 caches has also increased by 19% (2x clock increase) though we see the 6-core 2600 doing better (398 vs 339) likely due to less threads competing for the same L3 caches (12 vs 16). Ryzen2 L3 caches are not just 2x bigger than Intel but also 2x more bandwidth. Aggregated Memory (GB/s) 30.2 [+2%] 30.2 29.6 29.1 With the same memory clock, Ryzen2 does still manage a small 2% improvement – signalling memory controller improvements. We also see Ryzen’s memory at 2400Mt/s having better bandwidth than Intel at 2533. We see big improvements on Ryzen2 for all caches L1D/L2/L3 of 20-30% – more than just raw clock increase (11%) – so AMD has indeed made improvements – which to be fair needed to be done. The memory controller is also a bit more efficient (2%) though it can run at higher clocks than tested (2400Mt/s) – hopefully fast DDR4 memory will become more affordable. Data In-Page Random Latency (ns) 66.4 (4-12-31) [-6%] [-5][-4] 66.4 (4-12-31) 70.5 (4-17-35) 20.4 (4-12-21) In-page latency has decreased by a noticeable 6% on Ryzen2 (both 2700X and 2600) – we see 5 clocks reduction for L2 and 4 for L3 a welcome improvement. 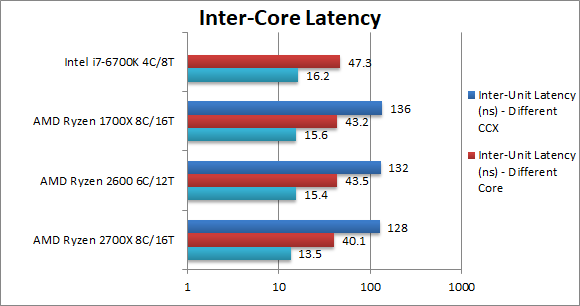 But still a way to go to catch Intel which has 1/3x (three times less) latency. Data Full Random Latency (ns) 80.9 (4-12-32) [-8%] [-5][-4] 79.4 (4-12-32) 87.6 (4-17-36) 63.9 (4-12-34) Out-of-page latencies have also been reduced by 8% on Ryzen2 (same memory) and we see the same 5 and 4 clock reduction for L2 and L3 (on both 2700X and 2600 it’s no fluke). Again these are welcome but still have a way to go to catch Intel. Data Sequential Latency (ns) 3.4 (4-6-7) [-8%] [-1] 3.5 (4-6-7) 3.7 (4-7-7) 4.1 (4-12-13) Ryzen’s prefetchers are working well with sequential access pattern latency and we see a 8% latency drop for Ryzen2. Ryzen1’s issue was high memory latencies (in-page/full random) and Ryzen2 has reduced them all by 6-8%. 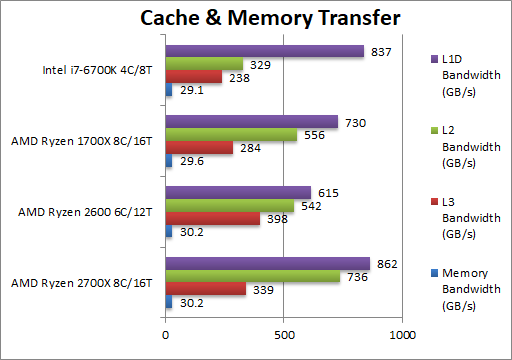 While it is a good improvement, they are still pretty high compared to Intel’s thus more work needs to be done here. Code Full Random Latency (ns) 88.6 (4-14-49) [-9%] [+1][+2] 89.3 (4-14-49) 97.4 (4-13-47) 70.7 (2-11-46) Out-of-page latency also sees a 9% decrease on Ryzen2 but somewhat surprisingly a 1-2 clock increase. Code Sequential Latency (ns) 7.6 (4-12-20) [-8%] [+1][+1] 7.8 (4-12-20) 8.3 (4-11-19) 5.0 (2-4-9) Ryzen’s prefetchers are working well with sequential access pattern latency and we see a 8% reduction on Ryzen2. While code access latencies were not a problem on Ryzen1 and they also see a 8% improvement on Ryzen2 which is welcome. 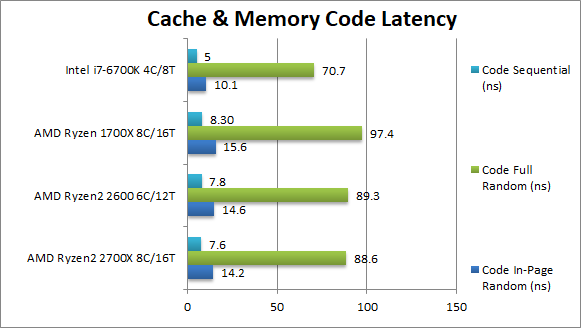 Note code L1i cache is 2x Intel’s (64kB vs 32). 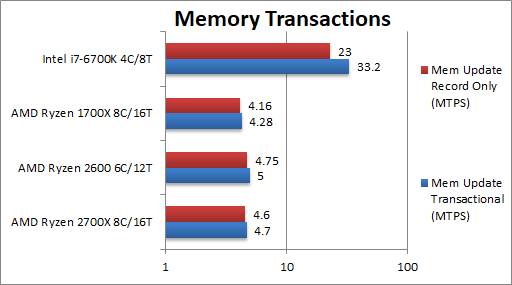 Memory Update Transactional (MTPS) 4.7 [+10%] 5 4.28 33.2 HLE Ryzen2 is 10% faster than Ryzen1 but naturally without HLE support it cannot match the i7. But with Intel disabling HLE on all but top-end CPUs AMD does not have much to worry. Memory Update Record Only (MTPS) 4.6 [+11%] 4.75 4.16 23 HLE With only record updates we still see an 11% increase. 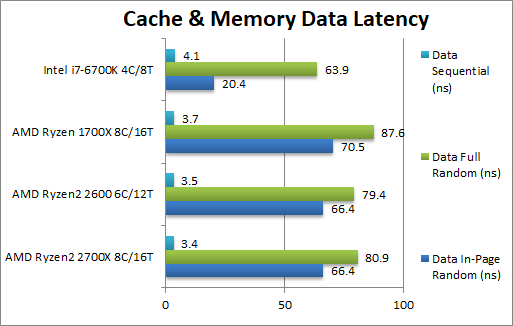 Ryzen2 brings nice updates – good bandwidth increases to all caches L1D/L2/L3 and also well-needed latency reduction for data (and code) accesses. 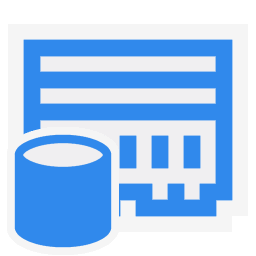 Yes, there is still work to be done to bring the latencies down further – but it may be just enough to beat Intel to 2nd place for a good while. At the high-end, ThreadRipper2 will likely benefit most as it’s going against many-core SKL-X AVX512-enabled competitor which is a lot “tougher” than the normal SKL/KBL/CFL consumer versions. As with original Ryzen, the cache and memory system performance is not the clean-sweep we’ve seen in CPU testing – but Ryzen2 does bring welcome improvements in bandwidth and latency – which hopefully will further improve with firmware/BIOS updates (AGESA firmware). With the potential to use faster DDR4 memory – Ryzen2 can do far better than in this test (e.g. with 2933/3200MHz memory). Unfortunately at this time DDR4 – especially high-end fast versions – memory is hideously expensive which is a bit of a problem. You may be better off using less but fast(er) memory with Ryzen designs. Ryzen2 is a great update that will not disappoint upgraders and is likely to increase AMD’s market share. AMD is here to stay! Tagged 2700x, amd, ddr4, ryzen. Bookmark the permalink.